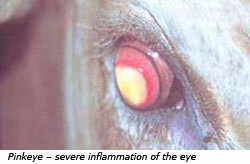 Pink-eye, or infectious bovine keratoconjunctivitis, is an infectious disease of cattle occurring throughout Australia. A number of organisms have been found to cause pink-eye but the most important is the bacteria, Moraxella bovis. Infective material discharged from the eyes of affected cattle can be spread to other animals by flies or onto long grass grazed by the cattle. Sunlight and dust exacerbate the problem. Other organisms can cause eye damage and allow Moraxella bovis to become established. Pink eye can be particular bad this time of year as often the combination of buffalo fly worry, dust and UV radiation increase the prevalence of infection. While deaths are rare, economic losses are very important. It may cause retarded growth rate, increased handling costs and costs for medication. Cloudiness and ulceration of the eye may occur, which can result in a mass of pink tissue on the surface of the eye. This can even result in blindness (white eye), and in severe cases the eyeball may rupture. 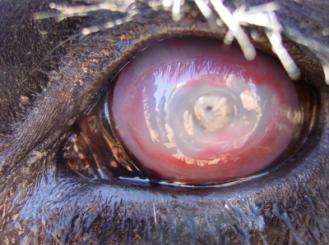 Most cattle recover from pink-eye without treatment, approximately 3-5 weeks after infection. However, treatment reduces the risk of further complications such as blindness and starvation, and allows the eye to heal faster. Preparations are available that contain antibiotics and anti-inflammatory drugs including eye ointments (Orbenin) and conjunctival injections. Pink eye patches (either commercial or home made) are an essential component of treatment to relieve irritation from sunlight and dust, and make the animal more comfortable. Consult your veterinarian to determine the best treatment option for you. As dust and flies increase, the risk of disease increases. To limit your herds susceptibility we recommend to hose the yards prior to work to reduce dust and to use adequate fly control (back liners, ear tags or back rubs). The vaccine, Piliguard, is reported to have had some success. It is a simple one dose injection, given 3-6 weeks prior to the problem season onset and annual revaccination is recommended.